Muswellbrook’s Mark Schmetzer has his sights on the $1.3 million Kosciuszko with not one but two horses but admits he has something of a mountain to climb to get them into the race. Both horses, Love None and Majestic Pedrille, kick off their spring campaigns and bids to attract a Kosciuszko sponsor in the Godolphin Ladies Day Cup (1280m) at Muswellbrook on Sunday. Schmetzer had also accepted with Majestic Pedrille in The Happy Tooth Class Two (1000m) but is leaning towards the other race. Sunday’s meeting features the annual Ladies Day with free entry, give-aways and Fashions On The Field. Love None, the second top weight, will be having her first start since failing as the second favourite in a 1600 metre race at Wyong in April while Majestic Pedrille has also not raced since April when eighth in a Highway Handicap at Randwick after bleeding from both nostrils. 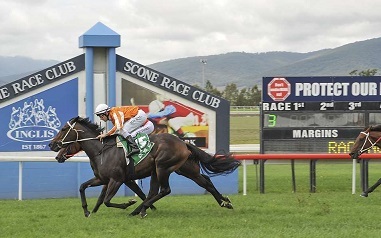 Majestic Pedrille salutes at Scone. Credit: Bradley Photos. However their task has been made harder with both horses drawing wide in the field of 12. “I think both horses are up to the standard of The Kosciuszko but because they have been off the scene for so long everyone has forgotten about them,” Schmetzer said. “Once Racing NSW announced The Kosciuszko our planning went into getting both horses into it. “I know it’s a big ask and we have not had any enquiries about either horse but you have to set goals. “Hopefully they will both run big races on Sunday, ideally finishing first and second and creating interest. Schmetzer has no idea what went wrong with Love None at Wyong. “She was at the end of a long campaign but her rider, Rachel Hunt, said she was not comfortable racing on the inside of other horses,” Schmetzer said. “The mare had blinkers on so I don’t know, it was just one of those things that sometimes happen in racing. Love None is the winner of four races at Muswellbrook and her preference for the track has to weigh in her favour on Sunday. Schmetzer believes that Majestic Pedrille would have won the Highway Hcp if she had not bled. “It was bad luck because if she had won people might have been talking about her as a Kosciuszko runner,” Schmetzer said. The Kosciuszko, restricted to country trained horses, will be run at Randwick on October 13 in conjunction with the $13 million The Everest. Tickets for The Kosciuszko are being sold at all AHA hotels that feature a TAB outlet. Twelve tickets will be drawn with each ticket holder selecting a country horse, subject to conditions including an agreement with the horse’s owners on the sharing of prizemoney. View the fields and form (including race replays) for Sunday's Muswellbrook meeting here. 1-1.00, HUNTER BELLE DAIRY CO. COUNTRY MAIDEN, 1450m: SO YOU OUGHTA 1, Elusive Valley 2, Femtometre 3, Mr Wong 4. 2-1.40, THOROUGHBRED EVENTS AUSTRALIA MAIDEN, 900m: LUCKY SIREN 1, Power Rush 2, In Good Health 3. Snippets Of Rain 4. 3-2.20, THE HAPPY TOOTH MUSWELLBROOK CLASS TWO, 1000m: WITH PURPOSE 1, Reprimand 2, Sweetest Eyes 3, Bed Talk 4. 4-3,00, TWO RIVERS WINES CLASS THREE, 1450m: VELARO 1, Aberration 2, I Wear Prada 3, Winner’s Lane 4. 5-3.37, GODOLPHIN LADIES DAY CUP, 1280m: MAJESTIC PEDRILLE 1, Princess Pattern 2, Taking Liberties 3, Love None 4. 6-4.12, THE REMINGTON MOTOR INN BENCHMARK 58, 1750m: ELABORATE 1, Chosen Prince 2, Bellabrook 3, Albert Of Monaco 4. 7-4.52, MORGAN AND ENGLISH COMMERCIAL LAWYERS CLASS ONE, 1280m: HIGHLY DESIRED 1, Funky Music 2, Rubble 3, Diamond Deluxe 4. Best Bets: With Purpose, Highly Desired.